slower manual calculation of completion statistics and trend tracking over time. When I started using a bullet journal in October I glued a hard copy of the template into the bullet journal. I also used my bullet journal to list most important daily tasks so carried it with me and referred to it frequently during the day. This addressed the first two disadvantages of having the printed list standalone, but not the third disadvantage which related to manual tracking versus electronic tracking. 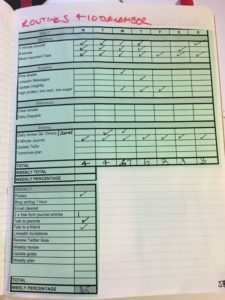 In preparation for my year on the road (which starts in one week from publishing this post) I decided to stop using my bullet journal two weeks ago. 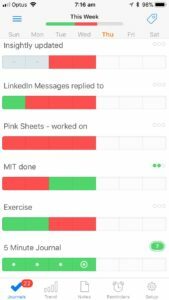 I had previously used an app called Way of Life to help build and track my Personal Knowledge Management (PKM) and Networking routine. 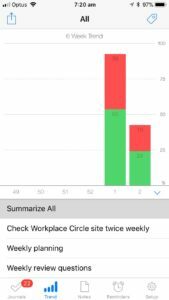 It was very quick for me to set up a list of the activities on my routine checklist in the app and I was able to start tracking them immediately on my iPhone. I track completion progressively during the day using a visual interface. Every item on the list is marked as done (green), not done (red), or skipped (grey). The skipped entry is useful for actions with a weekly frequency rather than daily frequency. Whenever I reach three consecutive days of ‘done’ against an action I get visual and audible feedback – reinforcement of maintaining a good ‘run rate’. Skipped days are not counted in this run rate tracking. While I like getting this feedback this feature can be turned off. 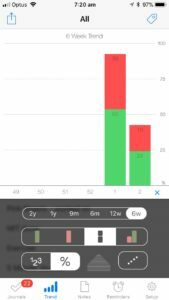 I can view completion trends over time in the app. Time interval for this graphical reporting can be set at 6 weeks, 12 weeks, 6 months, 9 months, 1 year or 2 years. The trend can be viewed for either all actions on my list or specific actions. 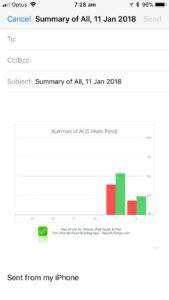 A image of the graph can be sent via email, but I don’t think the data can be exported for further manipulation outside of the app. While I’m only in my second week of using the app again I notice that I am completing more of the actions in my routine list. Combined with ease of use and mobility this means the app is working to help me get into regular habits with my routine and fine tune it over time.